If bedtime in your house means sharing the covers with a furry friend, then you’re in good company. Surveys say as many as six out of every ten pet owners let their pets bunk down at night on, or even in, their beds. But is it a good idea? For people with allergies, pets shouldn’t even sleep in the same room, let alone on the bed. Pet dander is a major trigger for allergies and asthma. 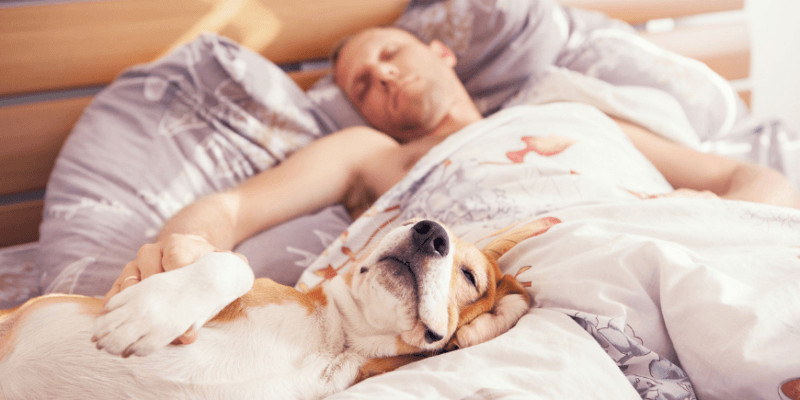 Some pets can disturb your sleep by snoring, licking, scratching and even hogging the blankets and pillows. Muddy paws, dead skin cells, fur, saliva, urine and faeces, even ticks and fleas … pets aren’t the cleanest bed fellows. Having a pet on hand to snuggle through the night helps many people settle better for sleep. Being near pets also boosts the hormone oxytocin in our bodies, helping us feel more relaxed and happy. Having a dog on the bed, alert even when its human is asleep, can make people feel safer, especially if they’re sleeping solo. Even a little dog offers a sense of protection. Pets are warm. Dogs run several degrees hotter than their humans, making them efficient, furry bed warmers on chilly nights. On top of the covers is better than under. Wash your sheets weekly on a hot wash to remove dirt and eliminate allergens. The cleaner your pets, the more hygienic your sleep environment, so give those dogs a bath. Protect your mattress with a waterproof, anti-allergy mattress protector from Protect-A-Bed. Pet dander and moisture can turn an unprotected mattress into a haven for allergy-causing dust mites. A Protect-A-Bed mattress protector will also protect your mattress from developing pet-related stains and odours. If you like to snuggle up with your furry friend at night then make sure you protect your mattress with a Protect-A-Bed mattress protector. Click HERE to purchase online or click HERE to locate your nearest stockist. Protect-A-Bed mattress protectors, your mattresses best friend!